Hi there! Just checking in with a new, free texture and some encouragement to try the optional challenge for this week's Photo Art Friday. So to summarize, there will be 3 or 4 separate components in your final abstract composite submission for Feb. 8th, 9th. Of course, while you use these separate components, the idea is to blend them together seamlessly to produce a piece of digital abstract collage art. Here is the required texture/background (Dropped Petals) you must use for this challenge. 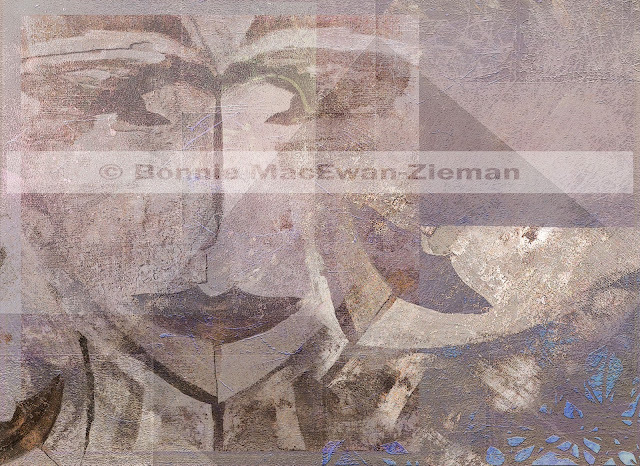 If you go to this previous post you will find several tips on how to make a composite piece of abstract art. 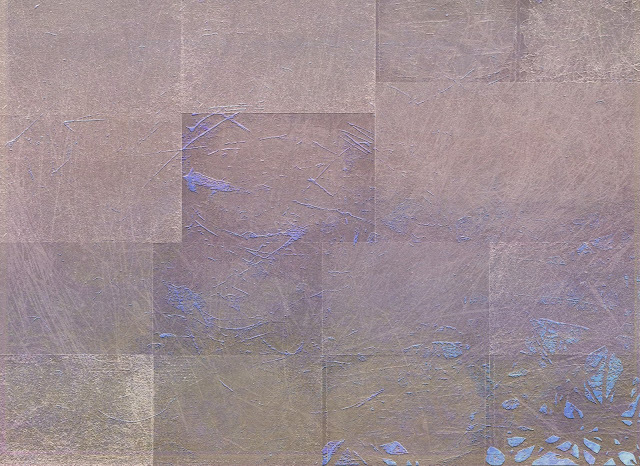 Here are the three components I used to make the piece of abstract art: 2 textures and an edited photo of one of my simple paintings. With this screen shot (click on it for a larger view), you can see most of my layers while creating this piece. 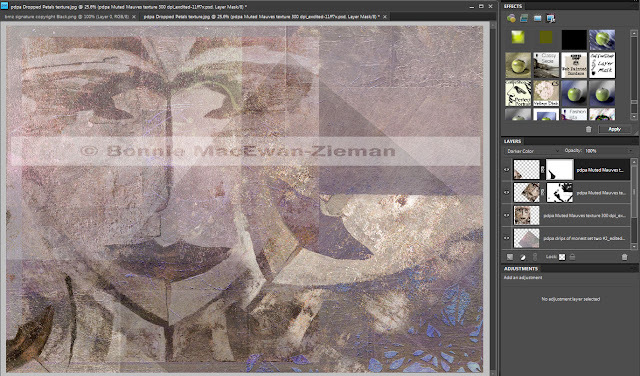 Unfortunately you cannot see the Dropped Petals texture/background which would be at the bottom of the layers. To it I added another of my textures (bottom layer visible) placing it at an angle and not covering the entire Dropped Petals 'canvas'. Opacities of the face image were adjusted to my liking. Layer Masks were used on the top two applications of the face image so that I could mask off parts of the image I did not want to appear on the final version. Once satisfied with the component parts, their placement and opacities, I sharpened the image. Then I merged the layers and then duplicated the merged layer and used the Filter>Poster Edges to 'marry' the different components together. I reduced the opacity of the Poster Edges to 35%. For this post I added my copyright banner. 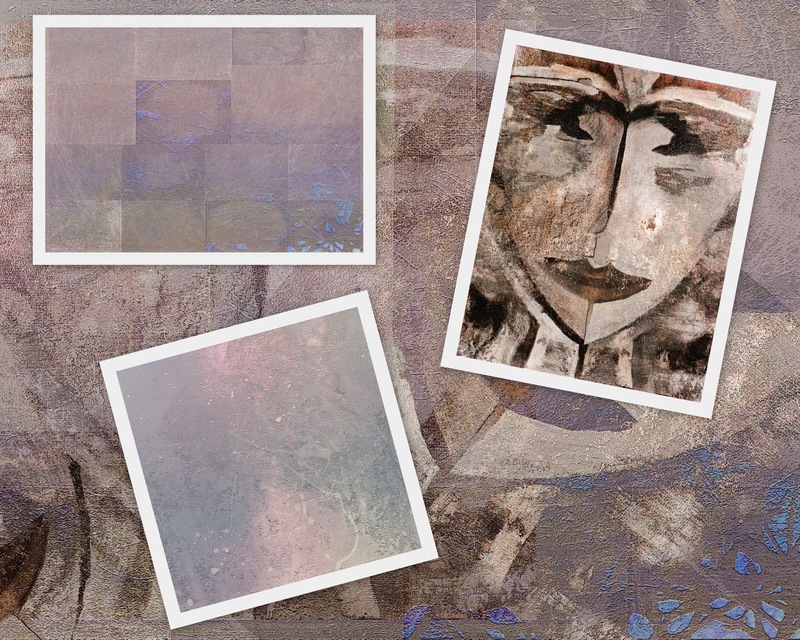 Note: Photo Art Resource Cache subscribers - a new set of textures was posted for you last weekend, and I added one sweet, new texture yesterday. They are waiting for you on site! Okay, that's it for now. Have fun with your digital, abstract explorations. Can't wait to have you hang them in our virtual gallery. Remember the doors open earlier than last year, at 4:00 p.m. Eastern Time on Thursday. I know, it's called Photo Art Friday, BUT at 4:00 p.m. Thursday, it IS Friday on the other side of the world. This is fun!! Thanks for the wonderful textures and the challenge! Enjoying this challenge, Bonnie! You are so generous with your talent! Oooh! I can`t resist this Asian inspired texture. Thanks for the treat!